Hi Allen. I would suggest talking with local engineers about the lumber grading. I imagine someone will know of a certified grading company. You could also talk with the larger local lumber yards or even go direct to the mills nearby (if there are any). In terms of the humidity, I we talking rain or humid? I know of several straw bale homes in Seattle and Whidbey Island, and those are doing fine. If you are similar in weather to that, you will be okay. I would suggest that you use a whole house dehumidifier in your design to help keep moisture moving out of the home. Like the site, excellent articles. Added your feed and will be returning to read more. Heads up though, your footer is askew when viewed with Safari installed on Windows 98. Found this blog so I thought it better to ask here. I have two questions related to water and design. I live north of Toronto and was advised to consider wood siding over the plaster on the straw bale. I heard you blog, and your main comment on siding seems to be with the labor required to install it. Can the plaster withstand our climate here, or is a siding a good idea. I see you have a workshop coming up in Ottawa where they have more snow, rain, humidity and temperature extreme problems than here. What finish will you use there. I wish I had the time to go. Secondly, I was advised to have the strawbales overlap the concrete foundation so that there is a drip edge i.e. a 14″ wide concrete beam to support the 18″ bales. Your dvd shows the strawbales actually short of the concrete edge so that the plaster is flush with the concrete. There must be a lot more rain where you are than here thus I guess you have confidence in not needing a drip edge? Any comments on the two methods? Hi Ryan. I trust in a solid plaster coat. Lime plaster has been used in the UK for centuries to great success. As long as the right material is properly applied, I trust it. I find siding a pain to install on a bale house and I think it is unnecessary. If you want that look, then, by all means, go for it. Just know it will take some extra work to do it right. I prefer to run my bales flush with the exterior these days and use a J-Channel/plaster screed to overhang the foundation by 1″. This stops wind driven rain from getting under the toe ups and it allows for a drip edge of sorts as well. It also gives a much cleaner finish than trying to make the plaster flush with the foundation as shown in the DVD. That detail IS required if you plan to use the mesh as your shear strength as the plaster needs to bear on the foundation directly to resist the lateral forces. I have started using other shear methods as a result and believe I am having much better success with them. Enjoy the site. Lots of wonderful information! I am located in South Central Mississippi. I too am interested in constructing a SB home; however, I am concerned about our humidity. I am aware of one SB home in MS, located about 3 to 4 hours north of here. We have recently viewed your new Post & Beam construction DVD. Lots of good ideas, but some questions come to mind including the use of roofing felt along the bottom outside edge of bales. My questions are: 1) by isolating the stucco from the bottom 3 feet of the straw wall, would this not weaken the stucco wall? I’ve always understood the bond between the stucco and the straw fibres is what gave it strength. 2) would you not stitch through this 3 foot water barrier? If no stitching is present in this area, would that also not weaken the structure? If you do stitch, you poke holes through the water barrier. Have you heard of a glue/water mixture being applied to the outside of the scratch coat of stucco in that lower area as an alternative to the roofing felt water barrier? Good points/questions. I am not a big fan of using the roofing felt on the structure for just the reasons you outline; however, the use is often required by the building officials and so I have included that in the video. The strength is not effected too badly because the mesh holds the plaster and gives it some good strength. The sewing is completely necessary and so, yes, the barrier is punctured anyway, thus making it somewhat useless in the end. It’s one of those silly code requirements that does not really make sense in reality. I like the idea of using a water/glue mix on the plaster, but have not had experience with it myself. I would be concerned about how that would effect the bond of the brown coat to the scratch coat as well. Hello! i’m looking to build a passive solar earthbermed home, and would like to build using straw bales. I’m worried about the earthbermed part, how to seal out moisture, while still retaining breathability. Is this possible? i can’t seem to find a good design. The earth bermed part should not be straw bale as it will not do well below grade. Other than that, the inclusion of proper drainage and waterproofing is essential. There are a lot of products out there, most of which are good quality but less than “non-toxic.” It may be a trade off for long term health: i.e. a less than green product up front allows you to build a long term green house. There are some plastic sheet designs, some with rubber membranes, that work well and are about the most green available. Good luck. Certainly worth you discussing this educational write-up. Fantastic! Thanks for answering all of these questions over the past couple of years. I see a few questions that touched on an area I am having a difficulty working through. I am planning on building three homes for my family and myself. It sounds a bit much, but will be a phenomenal farm when we are done. We (Really I) am pushing to use Strawbale construction, but we don’t want to have the plaster finish on either the inside or outside. We want to make use of the stones on the property to affix to the outside wall at least a few feet above grade and we are still debating on what to do above that. If there are enough stone we are not against going all the way up to the roof (They are going to be one story homes). We also want to keep all of the plumbing and electrical work away from the interior of the walls so that repairs can be made easily. I will be constructing my own 4 x 8 panels that can be removed easily enough to get access to the plumbing and electrical work. That means there will be a least a couple of inches of space inbetween the stud wall and my stone and wood interior panels. My question is how can we allow the straw bales to breath, if we have stone on the outside. There will be just a simple plaster coating on the bales (inside and out). Should we leave a gap between the outside frame and the stone to allow for air movement? And would you vent this up through the roof vents? Hi Ben. Sorry for the long delay. You can add rock right to the face of the bales as long as you have relatively large chinking (joints) between the stones made of a breathable mortar, preferably lime. 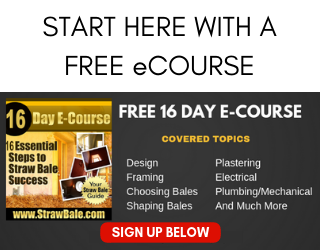 I would leave all of the plumbing to interior walls, out of the straw, and only put it in bale walls if you have to. In that case, I would frame out that whole section of wall and put the plumbing in the framed area, again, without contact with the straw. If you want to leave a gap between the bales and the stone, you can, but that means more material use. You would need to provide screened ventilation to that area and be sure to slip coat the bales on both sides. I want to make this, but got a couple of questions:1. What can I substitute for wheat starch? Don’t want to buy a whole packet only to use 4 tablespoons.2. Are the measuring cups and spoon American? In Australia, 1 cup = 250ml, whereas in the US, it is 235ml. I don’t have US measuring utensils. Hi Nola. The measurements are in US calibrations. You can substitute white glue (Elmer’s Glue here in the states) for the wheat paste. 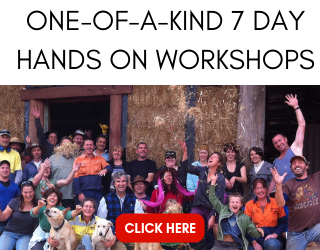 As an FYI, I am coming to West Wyalong in March and Perth in August to teach straw bale workshops. If you want to learn more about the classes, please visit http://www.strawbaleworkshops.com. Hope to see you there! Hello, what are your thoughts on a vapour barrier when building up in northern parts of Canada. Like Winnipeg MB, or Regina SK, or around Edmonton, AB. These are areas that get snow 5-8 months of the year. Generally, driving rain is not common, although there is rain, more or less depending on the region, in the summer. However, it’s not raining all the time, nor is it always humid. So, vapour barriers on the walls, floor, roof? Would a couple layers of lime coating be enough to withstand the snow? What would you recommend as foundation and flooring? Hi Lynn. I would recommend vapor barriers in the floor and roof but now over the bales. Instead, use a quality lime plaster in three coat (minimum) build up application. This will provide adequate protection against the elements and will allow the walls to naturally move the vapor (the lime will act as the vapor barrier to an extent). Be sure to seal the gaps around electrical plugs and other wall penetrations and the intersection of the wall with the floor and ceiling. Flooring can be anything; however, I suggest something with a high thermal mass to help store heat. Foundations will depend on the local geology so I can´t really comment on that. So…I’m building an addition on my home, (288sq. ft post and beam holding roof). I live in the piedmont of North Carolina where humidity levels in the summer are regularly 80-90%, In a climate like this, is it possible to build with straw and use no vapor barrier other than the plaster? I definitely recommend building without a vapor barrier other than the plaster. I would also recommend that you use lime plaster to help mitigate the humidity. Finally, I suggest you install an Energy Recovery Ventilator which will actually draw moisture out of the air and dump it outside of the house. Another plaster option is clay/earthen plaster; however, that is harder to maintain in wet climates on the exterior. That is a fantastic plaster for deal with humidity if you can protect it from the elements (rain most notably). What vapor barrier do we need and what is the best technique to apply it?? Hmmm. I don’t know for sure as I don’t put bales in my floors. I use 6mil plastic as a vapor barrier in regular floor construction and under slabs, so that might work. You may need something more like a sealed pond liner…not sure. Good luck and I hope you’ll send photos!!! Thank you for the reply too! Trying to find information online is overwhelming – there are so many ideas!! I’ll look into both of the ones you mentioned and let you know what we end up using. Thanks for the help! Andrew I was reading about some folks in Candada who frame their straw bale homes with 2×4 stud walls on 36″ centers and then stack the bales in each bay as infill insulation. IT seems like this would eliminate a lot of notching of bales, but at the cost of not having the bales in a running bond. Have you ever tried this? What are your thoughts on this method? We have our first straw bale building dried in and are looking forward to starting construction on the main house. I used a modified post/beam system where the only vertical supports are the window and door bucks along with a vertical box beam at each corner. We made the bucks/beams about 3″ shorter than the bale walls and then compressed the LBA (a box beam) with cord strap so that the LBA was down tight onto the bucks and then made positive connections between the bucks and LBA with anchor plates. I was suprised by how much time was consumed trying to get and keep everything plumb…I’m looking for a “better” method to do the larger house with. 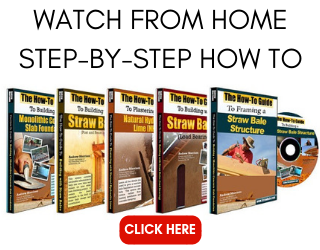 Right now I’m considering either the light wall construction (2×4 on 36″ centers) or the post/beam method shown in your straw bale framing video. Hey there Andrew just read all of the above and found lots of great information so thanks on that. Personally i’m building a solar passive green house, have no code regulations and live in southern Oregon where there’s wet fairly humid winters and very hot dry summers. I would like to install a 9’x 32′ northern wall using straw bale the west and east walls will be just framed and insulated while the entire south face will be woven poly. Obviously greenhouses produce a lot of humidity so for the north wall what would you suggest be used to keep moisture for inside the green house out of the straw wall, the north wall will have a adequate overhang with a gutter FYI. During summer months the green house will have a solar chimney affect which will work well to pull moisture out, but during the winter I’ll have around 4,000 gallons of water stacked vertically against the inside of the north wall, this water is my thermal mass for heating at night. My other worry besides the normal humidity in the green house is the thermal mass will act to form condensation on the back side of itself during certain weather, which i’m afraid will further burden the wall with moisture. Also would you advice a vapor barrier under the straw between the concrete being the concrete will have a lot of moisture contact. Any input would be greatly appreciated as i’m not a builder and have little experience here, learning as i go, and loving it all, thanks. Haha so i found this website randomly and really liked the info and here i am telling you the weather conditons only to continue exploring your website to find out your from Ashland, which is barely over an hour from me. well just thought this was an funny and awesome coincidence. keep up the great work glad to find another wonderful local business. Hi Victor. Funny about the Southern Oregon connection! I’m not sure you will gain much by building only the North wall out of bales. THe East, West, and South walls will lose much more than the North wall will retain. Coupled with the potential moisture issues you mention, that could be a recipe for failure. I have seen straw bale greenhouses fail and succeed. The usual difference between the two is the inclusion of air movement mechanical systems, Energy Recovery Ventilators ERVs, that help moderate air movement and condensation levels. Again, this is a lot for a greenhouse that has only 1 straw bale wall and might not be worth the effort. Hope that helps, and does not confuse things even more! Hey Andrew. I hope you are still replying to posts here. I am planning to build six straw bale homes in Rockwall, Texas(just east of Dallas). I have gotten some different opinions regarding bales and our climate. Our humidity is high at 73% on average, and we have very hot summers. We have gotten very little rain during the past two summers, but the humidity is still very much present. Some architects familiar with using bales tell me they will absorb the humidity and will grow mold and rot while others tell me they will be fine. I know there are many buildings using bales in Austin that seem to be doing well although the average humidity there is only a few percent lower than here at 70%. What do you think about using bales in this climate and is there anything that needs to be done differently to handle the humidity-heat combo? Thanks! Hi Rich. Humidity is a tough one. If you install whole house Energy Recovery Ventilation systems, you can do quite well. There are homes in Tennessee, Georgia, and other SE areas that are very humid and the homes are doing really well. I think it is possible, but you will need to manage the details really well. I would suggest rice straw if you can find it as it is grown (the rice) in standing water, so the stalks are very water resistant to begin with. Thanks Andrew! I will look at installing those during construction. I was thinking about installing a dehumidifier on each floor of the house to help dry the bales, but I am a little worried about the house feeling uncomfortably dry inside. The ventilator may be a better option. The reason for vapor barriers is not because it’s done on conventional construction as you suggest, it’s because of condensation. Let’s say it’s 30 degrees outside, and 70 degrees inside the house. The temperature within the wall thus varies: 30 degrees on the outer surface, 70 degrees on the inner surface, and somewhere in between as you move between those two surfaces. Cold air won’t hold as much moisture as warm air, and at some point within the wall that moisture will condense out–the same as dew, or rain. The vapor barrier is intended to keep the moisture in the air within the house even getting into the wall assembly to begin with. If you do get such condensation, you could get mold. I’ve been wondering about how straw bales are protected from this, and thought I’d better correct the misinformation in your article. I think the confusion here is in the title and terminology I used. I should not have said vapor barriers, but house wrap. 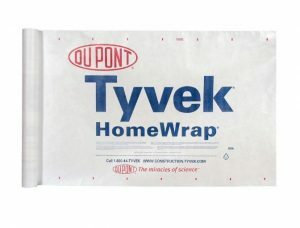 I agree with you completely about vapor barriers on interior surfaces; however, house wrap is not the same and it is what causes problems in straw bale walls, mostly due to the lack of connection between the straw and the plaster, but also because of trapping moisture inside the walls. Bale walls allow for such a slow and gentle gradation of temperature change across the surface and the ultimate dew point tends to occur directly behind the exterior plaster. Because the lime plaster (or earth plaster) is hygroscopic, it draws any condensation out of that dew point zone and releases it through the plaster into the environment. Hi Andrew! We are building a straw bale home in Moses Lake WA starting this coming spring 2015. We are in the design and drafting phase currently, and we have been speaking with TransMineral about using their NHL 3.5 lime plaster products for interior and exterior. We would like to utilize stone in our aesthetic, so were considering mortaring in a 18″-30″ (not decided yet on height) stone front along the entire bottom of our wall… We would apply the scratch coat on the entire wall, and then using lime mortar, apply a stone façade on the bottom 18-30″ of the wall, directly to the scratch coat. Would this cause a problem with moisture in the wall? Our breathability would be equal on both sides (interior/exterior)everywhere else on the wall, but would the mortar and stone on the exterior low portion of the wall cause a buildup of moisture, causing mold/damage? We just would like to break up the exterior aesthetic of the wall, and this would also provide protection from splashback…would love your input!! Hi Katie. Applying a stone skirting as you describe is fine. There will be a slight difference in breathability; however, not enough to have a major impact on the wall. Be sure to include a water table in the design (a flashing of sorts to direct water away from the transition from stone to plaster. Hi Juanma. I am not a fan of either of those products. I don’t like the inclusion of any vapor barrier or house wrap in a straw bale wall assembly. The walls are best left natural. In addition, the inclusion of a house wrap or vapor barrier separates the plaster from the straw and that weakens the entire assembly. I just read this article and it has become clear to me that as much use of moisture barriers should be used only in the first rows where rain can penetrate. If we are building a timber frame house in Derbyshire, Central England, that has straw bale within the cavity because we have to build an outer skin of natural stone, do we need any protection to the straw bale outer face or can we just use a vapour barrier as this is not subject to any direct weather? There will be a vapour barrier on the room side. To explain and simplify the method of construction. 150mm outer leaf of stone, 50mm cavity, straw bale insulation pushed tight against structural timber frame with OSB3 and vapour barrier. Hi Dave. I would prefer to not have OSB and vapor barrier on the interior. Instead, I would suggest plastering the interior directly to the bales and either burying or leaving exposed the timber frame. If you can leave it exposed, it is a beautiful look. On the outside, I would apply a scratch coat of plaster to mitigate any fire risk on the face of the bales and then provide a thin ventilation cavity (25mm – 50mm) and then the stone. Be sure to provide anchoring through the ventilation cavity for the stone work and proper screening to keep the ventilation space active. Best to you. I’ve seen french Web sites showing timber frame construction with small dimension wood with bales of straw between them fitted flush to the interior and exterior . They use OSB on the interior and what appears to be a breathable membrane on the exterior and then clad in timber . His house is now 4 years old with no complaints . What do you think of his method ? Is he asking for trouble further down the line ? I guess everyone has their preferred methods. I am not a fan of this method for several reasons. I’ve listed a few below. 1. The risk of condensation getting stuck in the wall behind the house wrap and OSB is too high for my liking. 2. The beauty of straw bales is in their natural curve which is completely lost behind the cladding on both sides of the wall. 3. There is no flame spread protection on the bales (i.e. plaster). 4. The structural strength of the wall comes from the plaster connection with the straw. That is completely absent. 5. The plaster helps to regulate moisture and air quality. That is gone in this method. 6. OSB is not a natural material and the potential for off gassing is high. 7. In several photos on their website, you can see the bales are not stacked in running bond. That weakens the overall strength of the building. I am fine with cladding a house for extra protection from the weather, but I don’t like the methods used. I prefer to see plaster/render on the interior to help moderate interior conditions and then a scratch of plaster on the outside. Then a rainscreen assembly and the siding. It provides a much better build overall. I hope you can help answer a theory of my husbands, He was planning on building with straw bales and was taught that he must render in lime then clad. would using a breathable membranes to wrap bails then clad in wood negate the need for lime scree. Hi Naomi. The most common finish is lime plaster/render with no cladding at all. If you want to use a clad exterior, then you will need to scratch coat the bales with a simple plaster to prevent flame spread. Then you would need to add a rain screen to allow moisture to move away from the walls and not get trapped behind the siding. Finally you would add the siding to the rain screen. A membrane is not a good idea for the bales as it does not provide any fire retardant and it separates the connection of the plaster and bale. I do not recommend using them at all. I am about to start a straw bale house in southern Chile, a southern Canada type of climate. I am attached to the idea of using metal siding over the straw bale wall on the no-sun exposure (south side in this case). What do you recommend for vapor barrier as it obviously needs due to the condensation between the metal siding and the bales? Also any ideas on how to attach the metal siding? I guess post and beam system won’t work. Hi Daniela. I recommend leaving a ventilation gap between the bales and the metal, rather than adding a waterproofing membrane. This allows the bales to stay dry. Be sure to plaster the bales with a scratch coat (first coat) of plaster to protect them from flame spread. I would use nailers over the scratch coat, attached to wood members of the original frame to attach the metal to. this will provide the ventilation gap and the anchoring. You may want to change the post and beam frame system to a more evenly spaced (and closer together) frame. For example, add wood members that width of the bales at each bale end (3′ on center) and insulate them as best you can. If you can get engineered I Beams, that would work the best. It’s simple and fast. No notching of the bales needed and you have anchor points every 3′. Good luck.